The penalty for using hand-held communication (e.g. your phone) or electronic entertainment devices while driving includes a three (3) day suspensions and insurance increases. Whilst we may take exceptions to the government statistics and wonder how they were obtained (as who would tell the police, “sorry I crashed because I was using my phone”), we all believe that the risk of being in an accident increases where the driver is distracted. Subsequently the government has created strict rules, regulations and penalties where the driver is caught by police using a device while driving. Hand-held devices prohibited – Wireless communication devices. regardless of whether the vehicle was in motion or not. 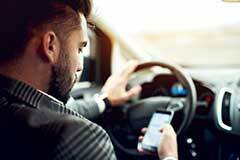 A driver cannot hold a cell phone in at anytime while on the roadway or risk receiving a traffic ticket. Drivers with a class G1, G2, M1 or M2 licence, who are convicted of distracted driving or driving with a hand held device received the same fine as A to G drivers but no demerit points. Cell phone tickets are very political. As such, court prosecutors have been instructed to fight these tickets very hard and not to drop them. Most cell phone tickets will go to trial, the prosecutor will not reduce these charges, or “take off demerit points”. was the driver operating a motor vehicle on the roadway.